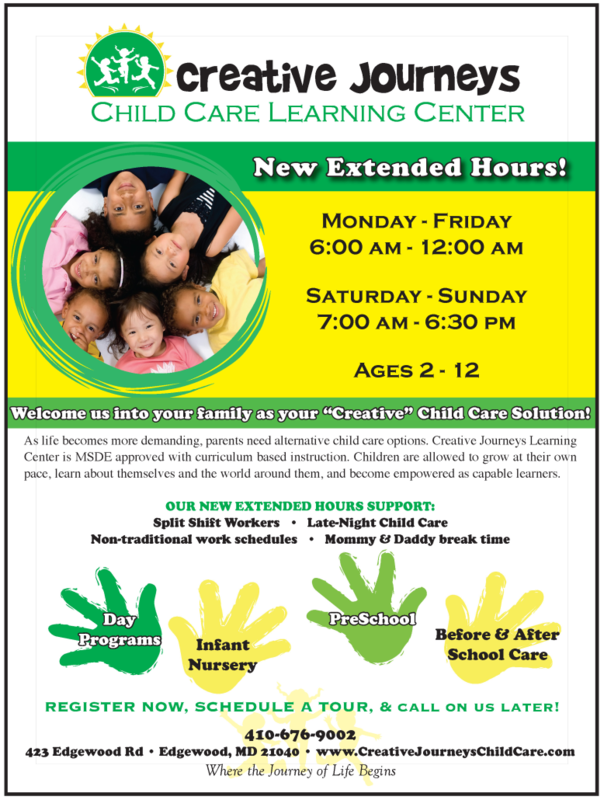 Creative Journeys Learning Center (CJLC) offers quality child care to children ages 6 weeks – 12 years. At Creative Journeys Learning Center (CJLC), every child has the opportunity to explore and learn, express creativity, discover their unique talents, and confidently find their place in our world. 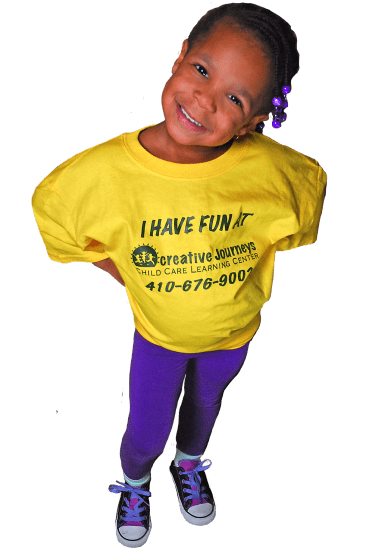 Our Creative Curriculum program of instruction is MSDE-approved to ensure your children are ready for lifetime learning from entering kindergarten and beyond; as our center is licensed through the Stateof Maryland. We are located near Aberdeen Proving Ground in Edgewood, MD, neighboring local schools and the MARC Train System (for area commuters). We are child-centered, family-oriented, and community-focused. We are a great partner to parents! We are dedicated to early childhood education and give our full attention to the needs of all the children whom we care for and educate. We believe that the positive experiences of infants, toddlers and young children are critical to healthy development and that these experiences establish a foundation from which children can reach their full potential. We believe that children benefit from practices that are well grounded in childhood research, such as Jean Piaget (how children think and learn) and Erick Erikson (socio-emotional development). We also strive to maintain a program where children and families from all religious, racial and ethnic backgrounds will find an environment that embraces their similarities and differences. Read More. Children’s inquisitiveness and creativity are what enliven and give direction to our curriculum. We adapt the MSDE-approved Creative Curriculum program of instruction into our daily lesson planning. At Creative Journeys Child Care Learning Center, we think of curriculum planning not as a series of recipes for activities, but rather as emerging opportunities for a variety of experiences to be offered to the children to help them deepen their understanding of their world. Emergent curriculum arises naturally from adult-child interactions and situations that allow for “teachable moments. Read More. CONTACT – 423 Edgewood Road Edgewood, MD 21040 NEAR Aberdeen Proving Ground, Area Schools, MARC Commuter Train Station Phone: (410) 676-9002 Fax: (410) 676-9003 Hours of Operation: 6:30am – 6:30pm (Earlier/Later hours available based on need) • Schedule aTour! Call (410)676-9002 For more details.